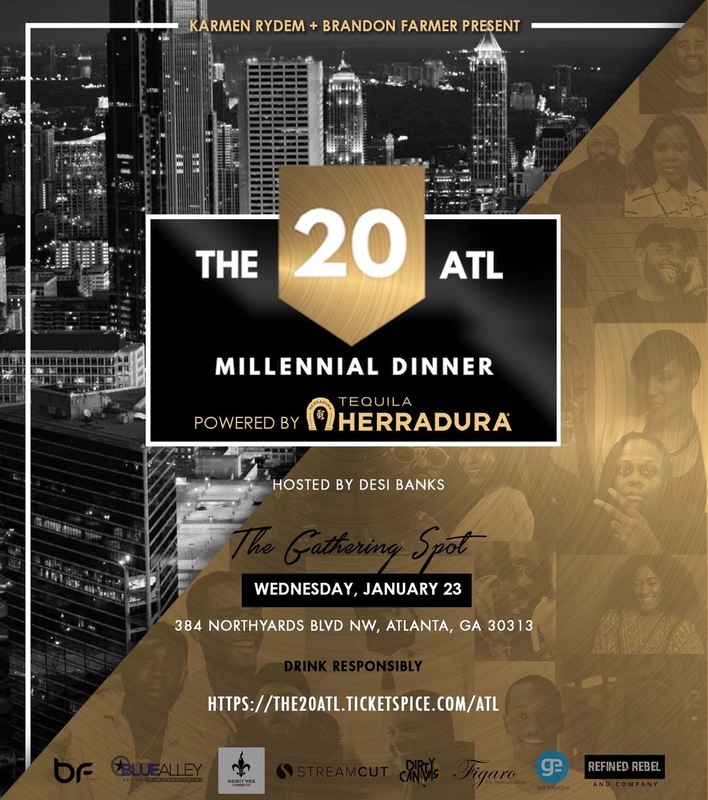 Creative Director Karmen Rydem and Music Executive Brandon Farmer have just announced the lineup for this year’s annual Top 20 ATL Millennial Dinner, taking place on January 23rd in Atlanta, GA. Celebrating their third year, this acclaimed event highlights 20 of Atlanta’s most influential and progressive creatives in arts, entertainment and community. Past recipients include entrepreneurs such as Ryan Wilson and TK Petersen of The Gathering Spot, Actor and Performer Jacob Latimore and Comedian DC Young Fly. This year, Rydem and Farmer have selected a dynamic group of young talent who are paving their own lane in the thriving city of Atlanta. This year, the event is held at The Gathering Spot. Guests will enjoy a delicious dinner prepared by TGS’s renowned Celebrity Chef Carlos, complimentary champagne towers and Herradura Tequila cocktails, as well as live entertainment from the host, Comedian Desi Banks with vibes all night from DJ Blak Boy. “We are very pleased to announce our lineup for the third annual The 20 ATL Millennial Dinner. Every year, we strive to acknowledge the most hard working young influencers who are making a solid name for themselves in their respected fields. We are so excited to continue in our tradition of connecting like minded individuals for an evening of celebration, networking and building”, Farmer states. Follow @The20ATL on Instagram to Stay Connected and Updated on the Event!